There are a ton of different cloud storage solutions for storing mobile photos: Amazon Photos, Onedrive, Google Photos, Google Drive, etc. I personally have been using Gmail since it first went live, so it was natural for me to use Google Drive as well. The service not only gives me a place to store files and photos, but it extends the space for my email too, which was beginning to max out. The question is: is Google Drive the best solution for backing up mobile photos? You cannot touch Google Photo files from Google Drive without downloading your entire Google Photos cache. 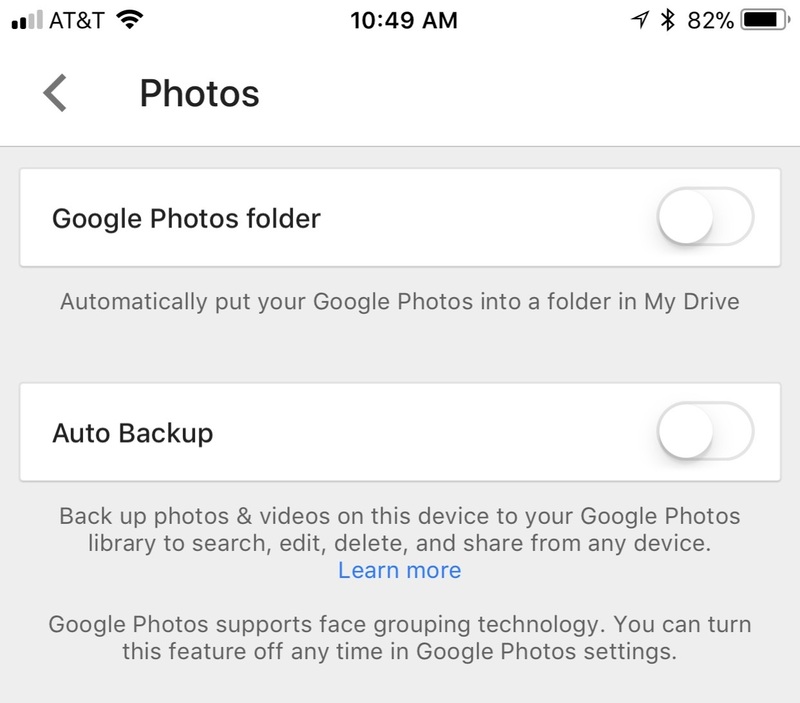 There is a setting in Google Drive called “Auto Backup” which allows you to automatically upload your mobile photos into Google Photo. This is convenient, because Google Photos has a lot of tools to manipulate photos, and is an overall better product for viewing photos. The problem with the automatic setting is that Google Drive will not upload your photos to Google Drive. This sounds nonsensical but it’s true. 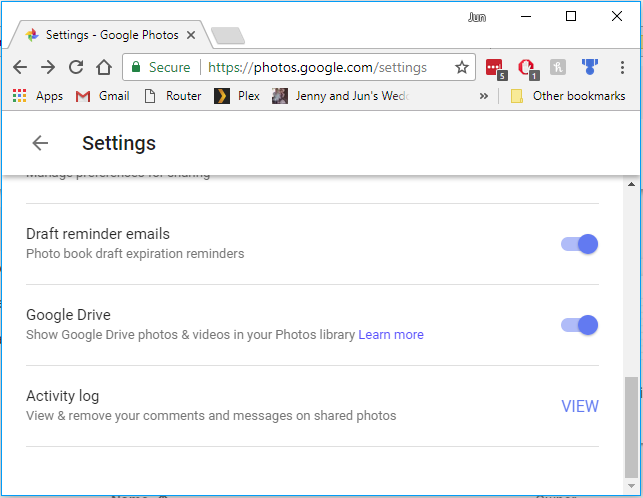 If you use the Auto Backup setting, you will be able to see your photos in Google Photos, but you will be unable to see it in Google Drive. 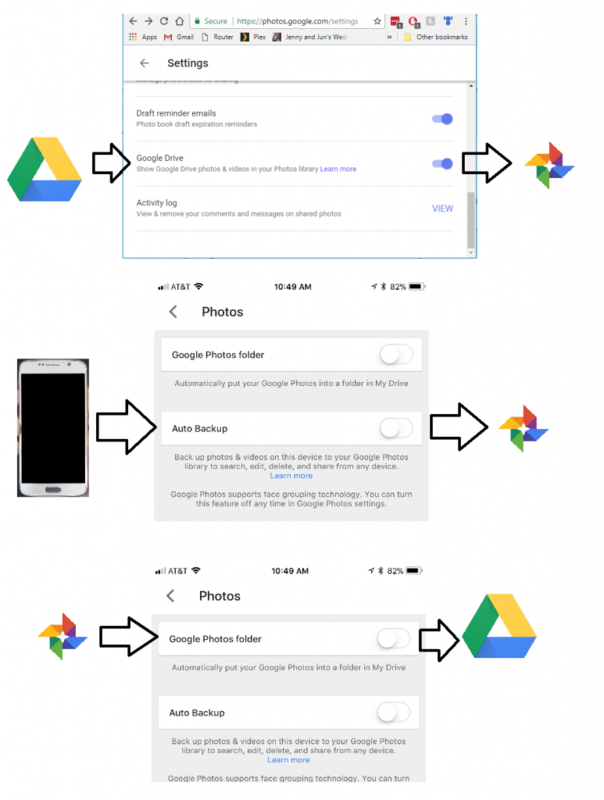 If you want to see the mobile photos that you just uploaded, you will have to also turn on the “Google Photos” folder, which will upload your entire Google Photos database into your Google Drive. Duplicate photos will show up in Google Drive if you download the entire Google Photos folder. 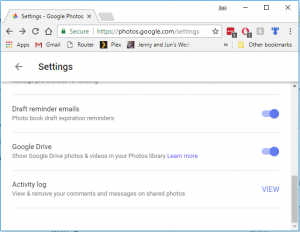 The “Google Drive” setting in Google Photos will automatically sync Google Drive photos into Google Photos. So if you download the entire Google Photos folder into Google Drive, you will be downloading the photos that you automatically uploaded, resulting in duplicate photos in your Google Drive! Top row: For many users, Google Drive photos are automatically synced to Google Photos. 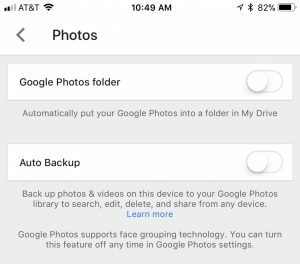 Middle row: On your mobile device, from the Google Drive app, if you turn on “Auto Backup” it will upload your photos to Google Photos. You will not be able to see these photos in Google Drive unless your Google Photos folder is downloaded. Bottom row: On your mobile device, from the Google Drive app, if you turn on the “Google Photos” folder then your entire Google Photos folder will be downloaded into your Google Drive. However, this will be a new folder in your Google Drive, which means that you will have a duplicate of all your photos! In the Google Drive or Google Photos app, upload your mobile photos on the go. Your photos will be uploaded into your Google Photos app, which will be visible in Google Drive. I can’t do this however, because this requires using the “Google Photos” folder in “Google Drive” as the primary and central source of photos. I personally have been using a different folder in Google Drive, and it has decades worth of data. I don’t want to change my primary source of photos to Google Photos. It is hard for me to recommend using the Google ecosystem to back up mobile photos. The fact that Google Photos and Google Drive are different products, and are difficult to use together (unless you do it the exact right way), means that a lot of users like me will either have to do research or make mistakes. Photo services should not be this complicated. If the Google Drive app uploaded photos to Google Drive, then this entire ecosystem would be way easier to use. But it doesn’t. I do have the option of one day downloading my entire Google Photos folder, deleting everything inside, and then moving my primary photos folder into the Google Photos folder. I haven’t tried this yet, but I have a feeling that it’s not as simple as it seems. Today is a really crappy day for everybody that doesn’t work for an internet service provider (ISP). The FCC just voted to remove net neutrality restrictions on ISPs. What this means is that ISPs will have more freedom to extract funds from customers in order to provide the same service. This kind of profit-maximizing behavior has been displayed time and time again in the past, from Facetime blocking to Netflix slow downs. Starting today, however, ISPs are free to throttle those connections as they see fit. They are allowed to charge customers to prevent throttling as they see fit. They are allowed to throttle the connections of competitors as they see fit. The goal of companies like Comcast and Verizon is to maximize their bottom line, so you can bet to see this kind of behavior in the near future. Put in your information: name, address, phone number. it will hurt your income, etc. Click “write congress” and your letter will be sent. Agree to having an automated machine call your phone. It is an extremely easy service that connects you with your local representatives. You don’t have to dial any numbers, and you don’t have to do any research. Don’t be nervous about talking to these people, they are just going to take a note of your opinion and say good bye. Talk to your local representative using the automated machine. A real person will pick up your call and ask you what you want. Tell them that you want to formally declare your opposition to repealing net neutrality. Tell them that the goal of ISPs is to extract money from customers as much as they can and it is against your best interests. Make it clear that you want net neutrality laws to stay.